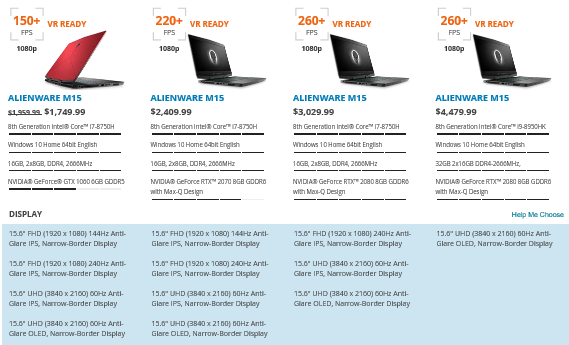 The product page for Dell’s Alienware m15 laptop range has been updated to show the new OLED display option for potential purchasers. The planned integration of OLED technology in Alienware m15, Dell XPS 15, and Dell G7 15 laptops was originally announced by the manufacturer in January and was expected to start rolling out in March. Better late than never, as eager Alienware m15 laptop shoppers have discovered that the long-awaited OLED display option has finally appeared in the configurator for the popular range of gaming devices. It appears all the current laptops in the series have been given an OLED option, with the top of the line Alienware m15 (i9-8950HK, RTX 2080 Max-Q, 32 GB RAM) having the new display option as justifiably the only choice available. 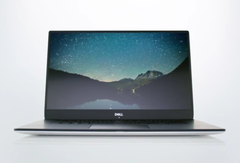 In Dell’s press release from the beginning of the year, there was specific mention of the Dell XPS 15 and Dell G7 15 also receiving upgrades to OLED display options. However, a swift browse through the manufacturer’s website reveals that neither of those laptop ranges is currently listed with the OLED screen choice. Only the Alienware m15 range has the new 15.6-inch UHD (3840x2160) 60 Hz OLED display…at the moment. However, April only just started, and when asked about the OLED option for the Dell XPS 15 back in February, Frank Azor said “April is the target”. With the fact that Alienware m15 laptops now have that choice and we are still in the first week of the month, it seems reasonable to believe that Dell is preparing to change the display options for the XPS 15 and G7 15 in the upcoming weeks, too.